Hauʻofa was born of Tongan missionary parents working in Papua New Guinea. At his death, he was a citizen of Fiji, living in Suva. He attended school in Papua New Guinea, Tonga, and Fiji (Lelean Memorial School), and later attended the University of New England, Armidale, New South Wales; McGill University, Montreal; and the Australian National University, Canberra, where he gained a Ph.D. in social anthropology. Hauʻofa published in 1981 with the title Mekeo: inequality and ambivalence in a village society. Hauʻofa taught briefly at the University of Papua New Guinea, and was a research fellow at the University of the South Pacific (USP) in Suva, Fiji. From 1978 to 1981 he was the Deputy Private Secretary to His Majesty King Tāufaʻāhau Tup Hauʻofa was born of Tongan missionary parents working in Papua New Guinea. At his death, he was a citizen of Fiji, living in Suva. He attended school in Papua New Guinea, Tonga, and Fiji (Lelean Memorial School), and later attended the University of New England, Armidale, New South Wales; McGill University, Montreal; and the Australian National University, Canberra, where he gained a Ph.D. in social anthropology. Hauʻofa published in 1981 with the title Mekeo: inequality and ambivalence in a village society. Hauʻofa taught briefly at the University of Papua New Guinea, and was a research fellow at the University of the South Pacific (USP) in Suva, Fiji. From 1978 to 1981 he was the Deputy Private Secretary to His Majesty King Tāufaʻāhau Tupou IV (The King of Tonga), while serving as the keeper of palace records. During his time in Tonga, Hauʻofa co-produced the literary magazine Faikara with his wife Barbara. In early 1981 he re-joined USP as the first director of the newly created Rural Development Centre based in Tonga. 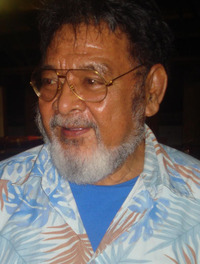 Hauʻofa subsequently taught sociology at USP and in 1983 became the Head of the Department of Sociology at the main campus in Suva. In 1997, Hauʻofa became the founder and director of the Oceania Centre for Arts and Culture (OCAC) at USP in Suva. As the author of Mekeo: Inequality and ambivalence in a village society; and Tales of the Tikongs, Hauʻofa dealt with indigenous responses to the changes occurring and those that have already occurred by modernization and development. Kisses in the Nederends, a novel; and, more recently, We Are the Ocean: Selected Works, include fiction, poetry and essays.